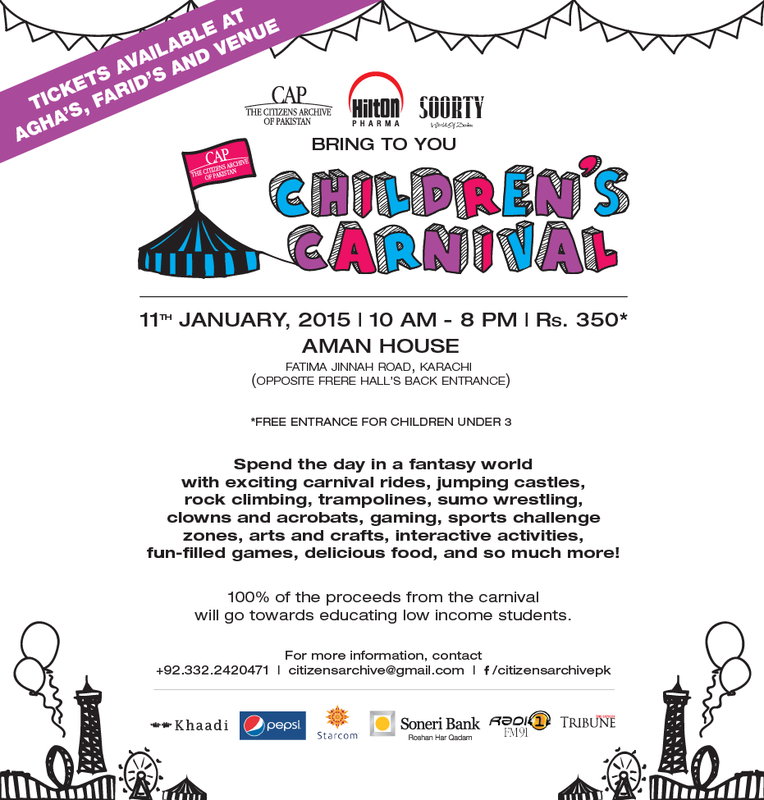 [Karachi, January 7, 2015]: The Citizens Archive of Pakistan (CAP) is organizing a Children’s Carnival on Sunday, January 11, 2015 at the Aman House in Karachi to raise funds for its education program in low-income schools. The Carnival has been dubbed a “fantasy world” that will feature an exciting array of rides, games, interactive activities, and food stalls geared towards the whole family. The Carnival has been made possible with support from Hilton Pharma Limited, Soorty Enterprises Private Limited, Soneri Bank Limited, Khaadi, PepsiCo, and Starcom. Among the different activities at the event, guests can expect carnival rides, jumping castles, rock climbing, trampolines, sumo wrestling, clowns and acrobats, gaming, sports challenge zones, arts and crafts, interactive activities, fun-filled games, delicious food and much more. “The purpose of this carnival is to specifically raise funds for CAP to enable education in low income schools in Karachi. The CAP School Outreach Tours focus on giving a broader world view, inculcating tolerant values and critical thinking skills in those students who are devoid of such learning opportunities,” said Executive Director Swaleha Alam Shahzada. Launched in 2008, the School Outreach Tours (SOT) program educates and inspires children from low-income neighborhoods in Karachi. CAP’s lesson plans exceed the perimeter of basic knowledge and information and focus on history, geography, science, English language, and more importantly, character building. Aside from motivating every child in the program, CAP also emphasizes on community building through research, role-play, and the use of film, photography and other interactive forms. With visual aids and innovative teaching methods, CAP has designed various projects and activities to encourage creativity and confidence among students. Many of the students CAP works with are first-generation school going children. The lessons teachers impart are meant to educate their entire families. CAP’s teachers are drawn from diverse backgrounds and they dedicate their lives to working in these low-income schools, opening up a world that would otherwise be closed to these students. Tickets are available at Agha’s Supermarket, Farid’s, and the venue. Further ticketing and venue information about the Children’s Carnival can be found on CAP’s Facebook page listed below. The Citizens Archive of Pakistan (CAP) is a non-profit organization dedicated to cultural and historic preservation operating in Karachi, Lahore, and Islamabad. We seek to educate the community, foster an awareness of our nation's history, and instill pride in Pakistani citizens about their heritage. Our organization has three main goals: to preserve and provide access to the archive, to build and support educational programs, and to develop educational products based on the testimonies collected.